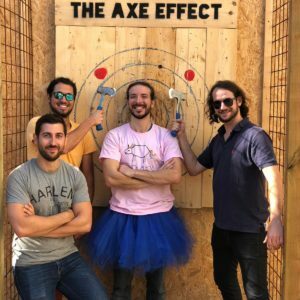 The World Axe Throwing League is the global governing body for the sport of urban axe throwing and defines league play, safety and aids in the growth of the sport. All of the rules and regulations outlined below are from the World Axe Throwing League. 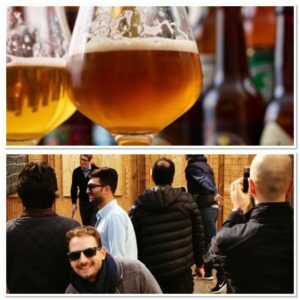 You can rest assured that we take safety very seriously and we want everyone to have both a fun and safe experience when they are at The Axe Effect. Additionally, we’ve included everything there is to know about axe throwing games, from rules used for warm-up games to the international standard for round-robin axe throwing tournaments. When you book an event at our urban axe throwing facility, you’ll be assigned an experienced coach who will keep score and call all the shots, just like a ref. Get ahead of the competition, bring your A-game and keep reading. We’ll provide a high-level overview, but you can read the official WATL rules on their own website. Age isn’t just a number—it ensures you can handle a real axe and play by the rules. All axe throwing participants must 18 years or older. Since you’re hitting it with steel blades, all targets need to be of good quality wood and sprayed with water to allow the axes to stick. Boards need to be replaced when they get too loose or rough looking. Each participant is allowed 5 warm-up throws before their first match and one 1 practice throw before any other matches. Every participant gets 10 throws per match. The winner of the match is determined by the most points after 10 throws. In the event of a tie, there will be a sudden death where participants will throw until one gets more points. Each game will have different objectives which can alter the way you choose to score points. Point values are always obvious and clearly marked on the targets. If they aren’t, your referee (coach) will take care of it. The blue balls, also known as the kill shot, award 10 points but only in moment of tie-breakers. Otherwise the blue balls are worth the value of the ring they are in. If the axe is in 2 rings simultaneously, then they are awarded the points for the higher valued ring. Stick and Stay Policy: The axe must remain in the target for the throw to count. If it falls out, then the throw will be awarded a “0”. 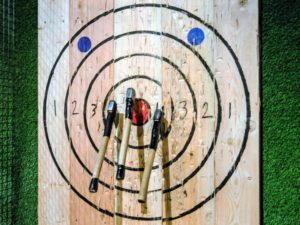 Axe throwing target to demonstrate scoring system. Where: Lines marked on the floor approximately 12-14 feet from the targets designate a range to throw from. Shorter players generally throw from the front line marked at 12′ and taller players generally throw from the back line marked at 14′. If you fall into that sweet average height range, you get to float between the lines. Why: The range of motion created by the thrower, referred to as rotation, will actually be larger for a taller player. This means that the axe will actually reach the target sooner with less rotation. By comparison, a shorter player’s rotation is smaller which means the axe has more opportunity to rotate within the same distance before reaching the target. The results are over-rotation and under-rotation. The axe has a greater chance of sticking to the target if it rotates exactly once before reaching the target. Therefore, a shorter player with a smaller rotation should stand closer to the target and a taller player with a larger rotation should stand further back from the target to allow the axe to rotate exactly once within the set distance. Each participant throws from a box that is 3 feet wide. The lead foot must be in the boxed area at all times when throwing, while the back foot can be outside or behind the boxed area. The front foot is allowed to touch the front line during a throw BUT if the foot is over the front line at the start/during the throw, it will be counted as zero. If their foot is over the line after the axe is release, the throw is counted. Participants are not allowed to step forward or over the line during throws. Axe throwing is a competitive sport which means players throw against other players. The coach will provide a count down from 3 to account for all 3 positions the axe should reach in the players’ form. 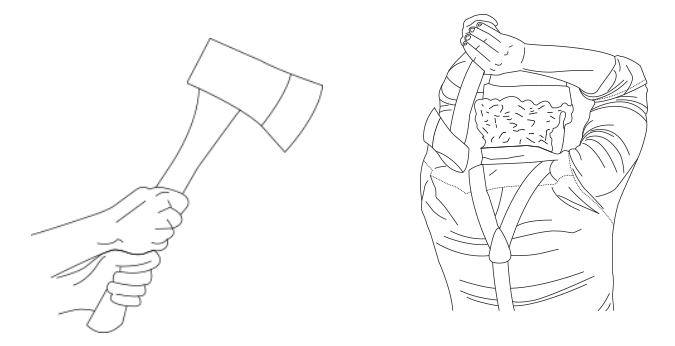 Learn more about how to throw an axe. Is axe throwing safe? Urban axe throwing venues pride themselves on maintaining outstandingly low incident rates. Safety is paramount in the sport of axe throwing and a major reason are the axe throwing coaches. Axes – Each and every axe is inspected prior to each event to ensure the axe is up to par. Participants are instructed to grip the axe by the handle and only the handle. Coaches ensure the blades of the axes are sharp enough to hit AND stick to the target, but are not razor blade sharp to the touch. No broken axes are ever used. 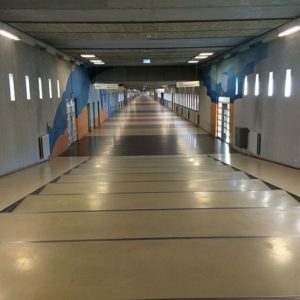 Lanes – Each throwing area is designated as a throwing lane. Fences block this area from the rest of the facility to keep throwers and axe all contained. Only the throwers and the axe throwing coach are allowed in inside the lane at one time. This includes ensuring the area behind the throwers is clear. Coaches – Each event is assigned a fully trained axe throwing coach. Coaches provide step-by-step direction throughout the entire event from orientation, demonstrating how to throw an axe, running tournaments to crowing the ultimate axe throwing champion. These coaches monitor the overall safety of the event as well as provide personalized coaching for the participants to be able to hit that bulls-eye. Countdown: This involves two teams starting at a high score of 100. Each point scored will knock off some points with the ultimate goal of getting to zero first. The tricky part? You have to hit zero bang on, meaning if your score is at 2 and you hit a bulls-eye, which is 6 points your score is now -4 and you need 4 points to get back to zero to win. Rings: While this game seems easy at the onset, it’s quite challenging once you start throwing. The goal with this axe throwing game is to hit each ring/target in the correct order, meaning your first throw is to aim for the outer ring, and the second throw is aiming for the second ring from the outside. Once you reach the bulls-eye your goal is to hit the blue balls in the top left and then the top right corners. The first team to successfully hit all targets in the correct order, wins! Tic-Tac-Toe: Here we bring you back a couple of decades to your childhood and introduce you to the axe throwing version of tic-tac-toe. This game includes drawing the tic-tac-toe grid onto your axe throwing target and each team or player gets a throw into the grid. The first to get all axes in a successful tic-tac-toe wins! Scoring: Each round, each player will get 5 throws from each target for a total of 10 and whoever gets the most points wins that round robin match. The format is as follows: bump axes, throw 5, switch places, bump axes, throw 5. Match Ups: Compete in a qualifying round where pairings with head-to-head match-ups don’t matter. Every player’s score will be recorded individually to determine their standing in round 1. The highest scorers match-up against the lowest scorers in round 1, which means players scoring closest to mid-range in qualifying will play each other. If there is an odd number of participants, the player with the highest score in a given round gets a by in the next round. This player will compete against the lowest scorer of the next round to even out the match ups. Essentially, the lowest scorer of a given round with an odd number of competitors has two match ups. Progression: Each successive round will have half as many players as the one before it until there are two players left for the finals. If a player has a by into the finals (due to odd numbers) that player will play the winner of the final 1 on 1 round for the ultimate championship. Team Tournament: For team battles divide the groups in half. Each player will get 5 throws. Add up the the points from each player and whatever team has the most points wins that round. The more the merrier! The sport of axe throwing is simply more fun with more people. We have 6 axe throwing lanes, where we can accommodate 6 people per lane. So 36 people in one time. We can typically accommodate much larger groups ranging anywhere from 50 to 120 participants. Depending on the group size, there will be various game options available for warmup but the official round robin tournament is a common practice that is always available. Depending on the size of the group, the length of the event will vary slightly. This allows all participants to practice axe throwing and get comfortable with what works/doesn’t work for them. It also allows enough time for the competition and one lucky player to be crowned the ultimate axe throwing champion! 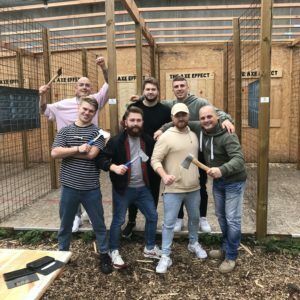 Axe Throwing is a unique way to celebrate a special occasion, organize a team building event or simply have a great time with family and friends. Now that you’ve learned all about axe throwing rules and games, it’s time for you to see if you can apply the skills. Wat is Urban Axe Throwing?